Putting a price tag on safety training for an employee is easy enough. Take factors such as course costs, production costs due to downtime by the employee attending the training and other incidentals and one can arrive at a dollars and cents amount. The hallowed obsession of managers, supervisors and HR departments with regard to return on investment (ROI) is a whole other matter. ROI is cost-benefit analysis at its most fraught and most uncertain: how does one properly assess and establish the benefits (returns) to be gained from safety training against the costs to the company thereof? How does one measure the mostly intangible (i.e. ‘benefits from better safety’) against the tangible (i.e. costs)? 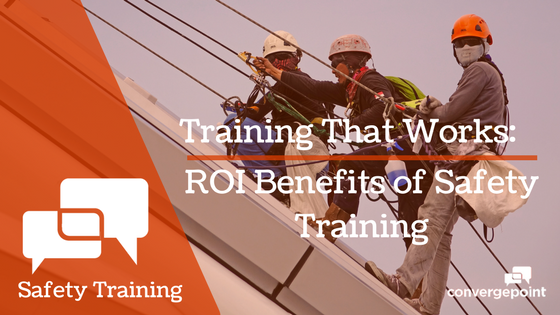 Is there true ROI in safety training? No one can justifiably argue that safety training should not be provided due to cost concerns. However, to what extent and what particular safety training should be provided is indeed contentious – and problematic from an ROI perspective. There are few safety managers or other line managers that have the luxury of not having to fight for their department’s training budget. The message from top management is often clear: ‘yes, we take safety seriously, but does it have to cost so much? And how much of it do you really need?’ Often, safety training can be a tough sell. The good news is that there is overwhelming evidence that safety training is not only intrinsically valuable within any company, it can prove its worth strictly in terms of ROI criteria. The National Safety Council (NSC) cites a slew of examples of ROI triumphs relating to having safety management systems in place in its May 2014 article ‘The ROI of Safety’. For example, the real cost of a fatality alone is astounding: the Centers for Disease Control and Prevention (CDC) estimates that a fatal injury carries an average cost of $991,027 (with this average including only hospital costs). The NSC puts the average cost to society of a fatality as high as $1.42 million. The NSC estimates that indirect costs can be up to 17 times higher than the direct costs of a fatality in the construction industry. Would those statistics alone not be reason enough to invest heavily in safety training? And what safety management system can be a success without valid training to back it? There is of course an intrinsic value to having safety training. It is a value that goes beyond the dollars and cents of ROI – it’s about keeping people safe. That may seem too ‘Utopian’ a goal in the tough bottom-line worlds of industry and business. However, if doubt remains, these words by the Federal Aviation Administration (FAA) in a 2012 paper should clinch it: “Some say that ROI has too much focus on money and not enough on safety. Whichever way you look at it, money and safety are inseparably linked. While return-on investment is a financial concept, the monetary returns are largely driven by the safety returns. Safety interventions can and do make a difference.” Indeed. It is beholden upon safety managers or anyone requesting budgets for safety training to simply not back down. Easier said than done, yes, but production need never be at the expense of safety. Safety has value that is both ROI-relevant and at the core of a company’s corporate culture. Of course, that is if a company is truly sincere about its commitment to safety.